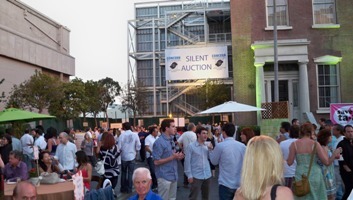 Several thousand poured onto the Paramount Studio back lot last Saturday for the Concern Foundation’s annual Block Party. This year’s Block Party honored one of LA’s top interior designers Donna Livingston. Donna Livingston Design was establish in 1980 and her spectacular projects are found around the world. She is on the list of “Top 100 Interior Designers” named by Architectural Digest and is a supporter of the American Cancer Society. Cancer Research is a cause dear to her heart. Also honored were Mary Moebius, M.D. a Child and Adult Psychiatrist in private practice in Tarzana since 1997 and Susan Inwood, CIMA a Senior Investment Management Consultant with Smith Barney. The Concern Foundation has raised over $41 million dollars to fund cancer research since 1968. Only 5% of funding goes toward administrative cost which means 95% of funds go directly toward cancer research. We all have been, or will be, effected by cancer. My sister-in-law has survived breast cancer, but unfortunately I lost my brother this past year to bladder cancer. If you have not known someone with this horrible disease, chances are you will. Even if you missed the 2009 Block Party, you can still contribute to this worthy organization. Thank you 2009 honorees for raising awareness and funding to help win the battle against cancer. To make your contribution, click here. This entry was posted in Community and tagged American Cancer Society, Architectural Digest, Block Party, cancer, Concern Foundation, Design, Donna Livingston, Mary Moebius, Paramount Studio, Smith Barney, Susan Inwood on October 11, 2011 by Chris McKenry.